Mark Your Calendars! Registration and housing for Nutrition 2019 opens on January 15th. Nutrition 2019 will offer even more value to our attendees with the best, ground-breaking research in nutrition science, affordable registration fees and even lower hotel rates. Register early to save on registration fees and to confirm your preferred hotel at lower rates! Don’t miss out on the opportunity to present your work at Nutrition 2019! Submit your science by January 18! 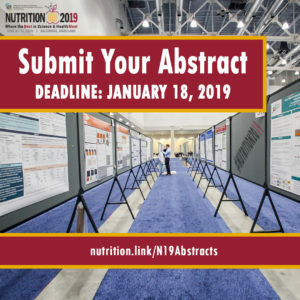 Don’t miss out on the opportunity to present your work at Nutrition 2019! The Nutrition 2019 abstract submission deadline is January 18 and we hope to see you and your science at the meeting! Please note that there will not be a late-breaking round for abstract submissions. Become eligible for travel awards and scholarships! Students and young investigators! As an ASN member, you are eligible to apply for award competition and travel funding opportunities during abstract submission! For more information and eligibility details, please click here. New this year! Abstracts for case studies and clinical vignettes (category 050) are being accepted. These offer a means of disseminating new knowledge gained from clinical practice. It can address an unusual condition; a complication of a known disease; an unusual side effect or adverse response to a mode of treatment; or a new approach to a condition. For instructions, see the Abstract Submission Guidelines and Instructions. The review period will take place January 23 to February 11. Abstract reviewers should have completed their terminal degree; students cannot serve as abstract reviewers. Click here for more details and to sign up. Advance Your Career at Nutrition 2019! A variety of career & professional development workshops will be held at Nutrition 2019. In addition, one-on-one career sessions will be offered for resume development, career strategy, interviewing support & more! ASN announced a new partnership with Herbalife Nutrition to award an annual education scholarship to a promising student seeking an advanced degree in nutrition or related field. We know dietitians are on the front lines of teaching consumers about the principles of healthy eating and, thus, have directed this scholarship program to Registered Dietitians (RD) or those intending to become an RD. For 2019, applicants must reside in the United States and be accepted/enrolled in a post-baccalaureate MS, PhD, ScD, DCN, DrPH or clinical health science graduate program. The first scholarship will be presented at Nutrition 2019, June 8 – 11, 2019 in Baltimore, MD, and the 2019 scholarship recipient will receive a complimentary registration to the meeting. For more details about the award and to apply, click here.